Improve your mood and fight fatigue and stress with this four-week meditation program. Join certified meditation and yoga expert Ceasar F. Barajas as he guides you through 20 days of meditation. You’ll complete five meditations per week over the course of four weeks. 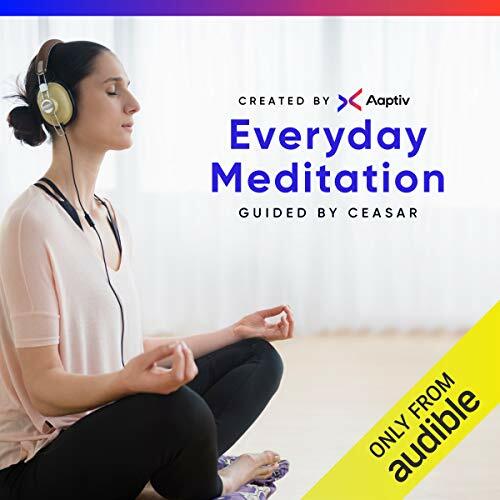 Whether you’re comfortable with meditation or it’s completely new to you, Ceasar’s unique combination of breath work, visualization, and mindfulness will re-energize you and wash away the pressures of your day. You’ll begin with just five minutes of meditation and build your stamina for stillness and reflection each day. By the time the program is complete you’ll be able to meditate for 20 minutes while using breath work to relax every muscle in your body. Newcomers and meditation skeptics alike will find themselves converted thanks to Ceasar’s openhearted, genuine, and empowering teaching style. ©2018 Aaptiv Inc. (P)2018 Aaptiv Inc.
perfect for beginners, and increments the practice longer and longer. great voice and background music. I've never written a review on Audible before, but wanted to comment because I am so glad to see Audible offering this sort of content. I had just started meditating and had made a commitment to learn more just before they released this, so the timing was great for me. It felt like a real gift. Over the course of the series, you gradually increase the time you meditate and learn a nice variety of techniques - so you learn what what works best for you. I love Caesar's voice and his whole style/approach.. I encourage you to commit to working through all the classes consistently - try not to judge yourself or the process after the first day or two. As Caesar says, "trust the journey". I was kind of sad to see it end. I am looking forward to trying more of the Aaptiv offerings. PS, it would be great if they could drop the "Audible Hopes You Enjoyed This Program" at the end - its pretty jarring. The narrator interrupts the meditation every 30 seconds with a harsh American Hollywood commercial voice. "Maybe you're sitting in a chair, maybe you're sitting in your back yard, maybe you're in your car picking your kids up from school..."
I could not stand it, plus there are harsh intros and outros "THIS IS AUDIBLE"... and "WE HOPE YOU ENJOYED..." sandwiching this 5 min meditation. I just spent 10 mins trying unsuccessfully to delete this out of my library. tone or pace needed to properly relax. I think the guides themselves are okay but a new narrator is needed. this is not the way to learn meditation, with distracting background music/sound track and misinformation. What a strange meditation series this is. I love that Audible decided to make something like this available and I love that it's free. Unfortunately the choice of music, narrator and his unfortunate delivery mean this package is a massive dud. I can't believe it was ever even released. After Day 1 and 2 were recorded, did anyone actually listen to the result? It's Tony Robbins style narration with Twenty Minute Workout music. I was anticipating "aaaand 3 mooore, 2 mooore." I meditate multiple times per day and use different programs to do so. I wonder if the creator or narrator of this package has ever meditated. I have to declare this one a DUD but hope Audible will try again. I was excited to try this one out. That's where the positive really ended. I couldn't manage to find anything but the last 3 'episodes' when trying to download to my computer to use with media player. So I kept clicking everywhere I could think of to try and figure it out, got frustrated and decided to check the reviews to see if anyone else had the same issue. Didn't see anything mentioned, however the ones that were posted led me to run through the sample really quick. That in turn made me glad I couldn't seem to get them to download. I'm sure Audible/Aaptiv thought this was a good idea, but it was poorly executed. The narrator's voice isn't one I would be able to sit and listen to for guided meditation for long. In fact, I barely made it halfway though the sample, his tone just isn't as soothing and relaxing as I had hoped for. And if you want me to concentrate on just breathing and not thinking about anything else for 5 minutes, don't interrupt every 10 seconds with little quips about 'great job, you're meditating' because no, I'm not with the constant interjections. Definitely won't be worried about this one disappearing from my library in a week or so. I found I was hitting fast forward - often. Which means I wasn't meditating. For me I could have handle the narrator had there been less chatter. Let the music guide. If interjection is desired place narration under the audio slightly. Soften it up. One of the few guided meditations I could actually get through. No personal complaints over the voice, or the performance. It was not another creepy gravely sounding older white guy with too much spit in his mouth behind a microphone creating white noise in the background. I had high hopes for this series. However, guided mediation is not supposed to be guided by someone who sounds like a Navy Seal training me for a special op's mission. There is a basic rule with mediation guidance; you can't take anyone anywhere you haven't first been yourself. The guide completely got in the way and misses the point. Just when you thought you'd be able to have a little peaceful interlude, up he pops again to "guide" you up the hill for your mission. I find it difficult to believe that this has been released by Audible and their partner Aadaptiv. I have a very hard time keeping my mind from wandering during many guided meditations, so the narration that bothers other reviewers I find very helpful. I don't find Caesar's voice irritating at all - he's positive and soothing rather than soporific. I have wanted to start a meditation practice for a long time and haven't been successful. I'm more hopeful about this approach than any of the others I've tried. Giving it 4 stars for now until I get into it further.